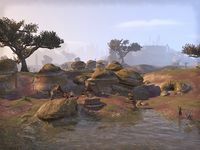 The Crescent River Camp is located northeast of the Do'Krin Monastery, in central Reaper's March. The camp is inhabited by a group of three bandits. A copy of The March Explored can be found at the camp. This page was last modified on 23 December 2018, at 21:08.